Background information on our boutique and founder! Our scarves make perfect gifts! A silk scarf from The Scarf Boutique makes a great present whether it's for a birthday, anniversary, holiday or even "just because", gift. And, what's more, your gift won't wilt (as with flowers) after a week or two, or rot (as with fruit) if it doesn't get eaten. For years to come, your thoughtfulness will be remembered each time The Scarf Boutique scarf from you is worn! Our founder, Kathleen (Morrison) Gorbach, has been admiring beautiful silk scarves since she was a little girl. Kathy grew up in New England just outside of Boston. She comes from a family of artists, business entrepreneurs and engineers and began her career in the computer systems side of clothing retail in the 1980s. Kathy held key positions with the largest & most successful off-price retailer in the world. Over the following two decades, she became an expert in commercial software engineering and quality assurance. 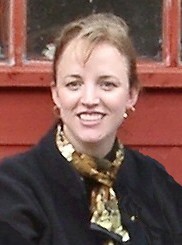 Leveraging natural and honed skills, in 2008, Kathy formed the Scarfsense design house. The Scarf Boutique is the primary retail shop for Scarfsense Signature scarves and other scarves that Kathy feels are special.